Raise your hand if you’ve ever felt personally victimized by pop-up ads. Everyone? We all know that pop-ups can be annoying, intrusive, and even dangerous—but can pop-ups add value to your marketing strategy? Evidence suggests that they deserve a spot in your organization’s digital marketing tool kit. THE ROAD TO HELL WAS CODED WITH GOOD INTENTIONS. Over 20 years ago, a man named Ethan Zuckerman wrote the code for the first pop-up ad. He was trying to comfort a major car company who freaked out when their ad was posted on an X-rated site. To avoid implying an association between their brand and the page’s content, Zuckerman coded the ad to open in a new window. He has since apologized, but our browsers will never be the same. ALERT! YOU ARE THE 100,000TH VISITOR! The early pop-up ads were very annoying—technicolor ads for high-speed DSL or low-rate mortgages that sent users’ cursors quickly to the “x” at the top of the window. In 2004, a study conducted by researchers from Yahoo! and eBay found that 95% of users hated pop-up ads and even transferred that hatred to the advertisers. Soon, ad-blocking software was standard in all browsers and security suites. Pop-ups have made a comeback and they’ve had some work done. 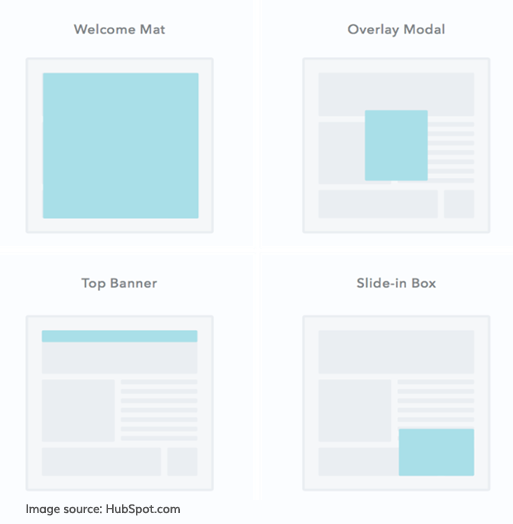 These days, you’re most likely to see more subtle pop-ups in the form of a welcome mat, overlay, top banner, or slide-in box. Instead of just trying to trick a visitor into clicking on a flashing button, these new pop-ups rely on an understanding of the visitor’s wants and needs. The new generation of pop-ups has the ability to play a significant role in enhancing content and encouraging conversion. THEY’RE ANNOYING, BUT THEY WORK. The fact is, when used correctly, pop-ups can enhance a user’s experience on a website. In turn, that user is more likely to click through pages, sign up for a subscription, or start a chat. WHEN IT COMES TO USER EXPERIENCE, LET YOUR MEMBERS LEAD THE WAY. Don’t rush the timing: Don’t trigger the pop-up too quickly. Waiting 60 seconds gives users time to digest some of your content and decide if they want to see more. Test frequently: Let the numbers guide you as you determine what marketing strategy works for you and your members. Respect your users: Don’t try to pull any tricks! Users are wary of pop-ups already, don’t give them a reason to give up on your site. Avoid hidden exit buttons, multiple pop-up windows, and excessive input fields. Most importantly, a pop-up must be directly related to the content the user is viewing. DON’T INTERRUPT THE USER EXPERIENCE, ENHANCE IT! The best ads enhance the content on the page and assist the user in some way—whether it’s a quick yes or no about a download option, a request to chat, or a discount offer on an item currently on the screen. In the example below, a slide-in appears on the right side of a website. The ad doesn’t impede browsing or the user’s view of the content; instead, it offers additional resources related to the page content. This is an excellent example of minimizing the interruption, offering helpful information, and favoring a smaller format that doesn’t distract the user. TO CREATE THE BEST EXPERIENCE FOR YOUR MEMBERS, THINK MOBILE FIRST. Pop-up ads that annoy users on web browsers quickly become unbearable on a mobile browser, which is why Google punishes sites that interrupt user experience on mobile devices. Less than 10% of users go to page 2 of their Google search results, so it’s important to stay in Google’s good graces and avoid losing rank in mobile searches. Hide pop-ups on mobile views or use formats that cover only a small portion of the screen. WILL POP-UPS WORK FOR MY ASSOCIATION? The stats show that pop-ups can be effective—but to what end? Marketing blogger Matthew Woodward experimented with pop-ups and found that he was able to increase his blog subscription rate by 44.71%. However, he also experienced a drop in both pages per visit and visit duration. The answer? It depends on your members and your goals. Consider your audience and then consult your CIO or Technical Director if you’re interested in adding pop-ups to your marketing strategy. Unique pop-up approaches can be an important part of your online content strategy. Find out how to enhance your content and engage your audiences by downloading our whitepaper, Master the Digital Experience with a Content Strategy.